The iconic statue of Christ the Redeemer stands with his arms outstretched to the south. His back is turned to the north edge of Rio de Janeiro’s Guanabara Bay where the metropolitan landfill of Jardim Gramacho (“Gramacho Gardens”) was built. The site receives more trash every day than any landfill in the world. 7,000 tons of garbage arrive daily making up 70% of the trash produced by Rio de Janeiro and surrounding areas. 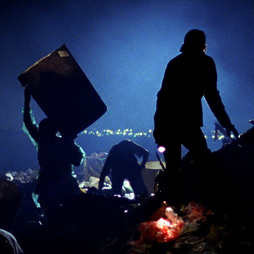 Established in 1970 as a sanitary waste facility, the landfill became home to an anarchic community of scavengers during the economic crises of the 70’s and 80’s. These catadores lived and worked in the garbage, collecting and selling scrap metal and recyclable materials. They established a squatter community (the favela of Jardim Gramacho) surrounding the landfill, which is now home to over 13,000 people who are entirely dependent on an economy that revolves around the trade of recyclable materials. In 1995, Rio’s sanitation department began to rehabilitate the landfill and formalise the job of the catador, granting licenses to catadores as well as enforcing basic safety standards, like the banning of children from the landfill. They also began a pilot project to create a carbon negative power plant fuelled by urban solid waste. On their side, the catadores formed ACAMJG, the Association of Recycling Pickers of Jardim Gramacho, whose president, Tião Santos, is featured in WASTE LAND. ACAMJG lead the way in community development. Under Tião’s leadership, ACAMJG has created a decentralized system of recycling collection in neighboring municipalities; the creation of a recycling center, professional recognition of the catador, enabling catadores to be contracted for their services, the creation of a 24 hour medical clinic, and the construction of a daycare center and skills training center. In addition to their community initiatives, ACAMJG leads a national movement for greater professional recognition for the catador and support from the federal government and has teamed up with other movements across South America to hold the first international conference of catadores in São Paulo in November 2009. Today roughly 3,000 catadores work on the landfill (although only 1,752 are officially registered) removing 200 tons of recyclable materials each day. They have extended the life of the landfill by removing materials that would have otherwise been buried and have contributed to the landfill having one of the highest recycling rates in the world. The landfill is scheduled to close in 2012 and groups like ACAMJG are fighting to raise support to provide skills training to catadores.